Pre-heat oven to 375. Toss the onion, green bell pepper, and tomatoes with olive oil. Spread on foil lined baking sheet and season with salt and pepper. Roast for 15 minutes, stirring halfway through roasting. While the veggies are roasting, mix the corn, black beans, cream cheese, cheese, diced green chiles, chili powder, cumin and garlic powder in a large bowl until combined. When the veggies are done add them into the bowl. Stir everything together. Spoon the mixture into the center of each tortilla (1-2 Tbsp) and tightly roll them up. 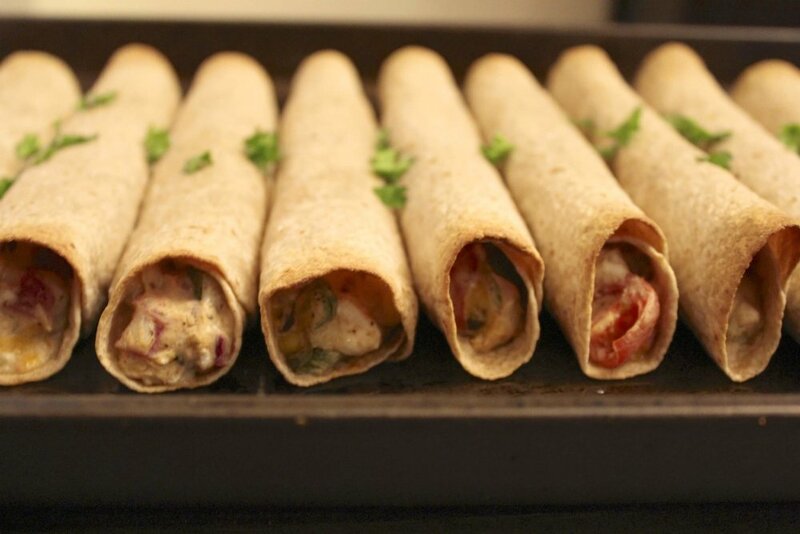 Line taquitos up on a baking sheet. Brush the tops with olive oil and sprinkle with salt. Bake for 17-20 minutes, until golden and oozing cheese. Serve with salsa and guacamole.